The IBM® b-type Gen 5 Fibre Channel directors and switches provide reliable, scalable, and secure high-performance foundations for high-density server virtualization, cloud architectures, and next generation flash and SSD storage. They are designed to meet the demands of highly virtualized private cloud storage and data center environments. 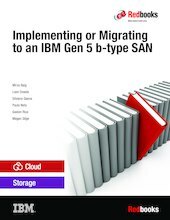 This IBM Redbooks® publication helps administrators learn how to implement or migrate to an IBM Gen 5 b-type SAN. It provides an overview of the key hardware and software products and explains how to install, monitor, tune, and troubleshoot your storage area network (SAN). Read this publication to learn about fabric design, managing and monitoring your network, key tools such as IBM Network Advisor and Fabric Vision, and troubleshooting.